WinSnap is a clean, fast, simple and user-friendly utility for taking and editing screenshots. 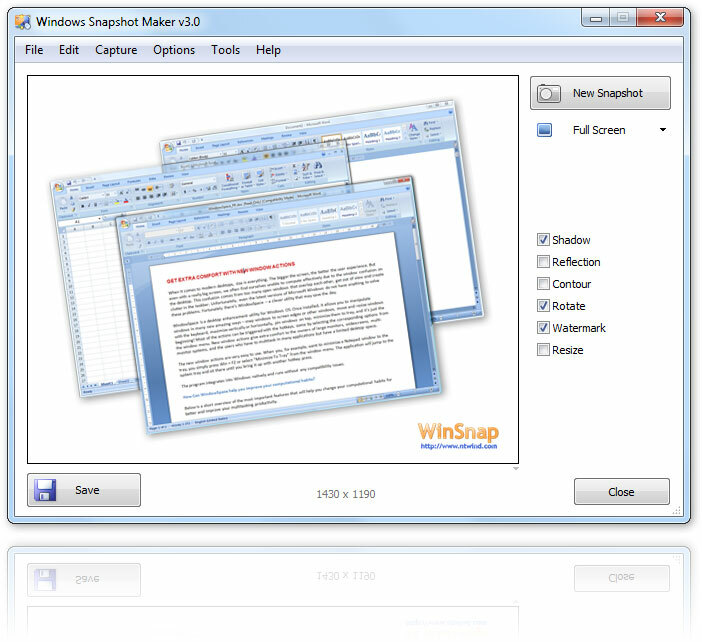 WinSnap can easily capture windows of non-rectangular form with customized and transparent backgrounds, including Aero Glass on Windows 7 and Vista. WinSnap adds eye-candy drop shadows, reflections, rotations, watermarks and other effects on the fly. WinSnap supports a variety of image formats and provides advanced auto-save features. ...... WinSnap supports a variety of image formats and provides advanced auto-save features. WinSnap is the first screen capture utility that offers complete support for both 32-bit and 64-bit editions of Windows 7 - the latest operating system from Microsoft. WinSnap has always had the ability to capture non-rectangular windows and regions. Note that the rounded corners on Windows 7 are different from Windows Vista. Qweas is providing links to WinSnap 3.5.5 as a courtesy, and makes no representations regarding WinSnap or any other applications or any information related thereto. Any questions, complaints or claims regarding this application WinSnap 3.5.5 must be directed to the appropriate software vendor. You may click the publisher link of WinSnap on the top of this page to get more details about the vendor.